John L. Bryan, Jr. graduated from the University of Florida where he received his Bachelor of Science in Business Administration degree with honors. 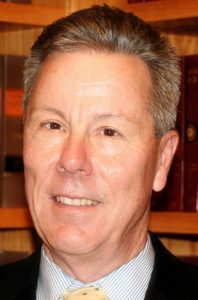 Continuing his education at the University of Florida College of Law, Mr. Bryan earned his Juris Doctor in 1974, also with honors. John was a member of the Order of Coif and served on the University of Florida Board of the Law Review. Mr. Bryan joined Scott/Harris in 1975 and became a shareholder in 1979. In his years as a trial lawyer, Mr. Bryan has handled trials at every level from Summary Claims Courts to cases resulting in jury verdicts of several million dollars. He has taught various trial related subjects to other lawyers as part of the Florida Bar Association’s continuing education program. John serves the community as a member of the Board of Trustees of the Jupiter Medical Center Foundation, Inc., a corporate member of the Jupiter Medical Center, Inc. and as a member of the Board of the Ambassadors of Jupiter Hospital. John L. Bryan, Jr. has been selected as one of Florida’s Super Lawyers each year since 2006. Super Lawyers are the top 5% of attorneys in each state as chosen by their peers and through the independent research of Law & Politics magazine.